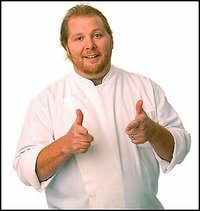 Mario Batali is an Italian-American chef and restauranteur. He attended Rutgers University where he double majored in Spanish Theater and Economics, graduating in 1982. He also started working as a dishwasher at Stuff Yer Face restaurant in New Brunswick, New Jersey. He quickly moved up from dishwasher to pizzaman during his college years at Rutgers. He spent time at Le Cordon Bleu in London and three years as a chef's apprentice in Northern Italy. With his partner, Joe Bastianich (son of Lidia Bastianich), he went on to own the restaurants Babbo Ristorante e Enoteca (1998), Lupa (1999), Esca (2000), Otto Enoteca Pizzeria (2003) Casa Mono (2004), Bar Jamon (2004), Bistro du Vent (2004), and Del Posto (2005) as well as a shop called Italian Wine Merchants (1999). He has starred in four Food Network shows and appeared in commercials for GladWare containers. In 2005 he won the James Beard Foundation's "Outstanding Chef" award. He currently lives in New York with his wife Susi Cahn (daughter of Miles and Lillian Cahn, founders of Coach Leather) and two sons, Leo and Benno. His father is Armandino Batali, owner of Salumi in Seattle. Batali is often identified by his constant wearing of orange clogs. It has become one of his symbols, and a pair appear on the back cover of his 2005 cookbook, Molto Italiano.